Charles-Valentin Alkan. Le festin d'Esope and other works for solo piano. New York: Dover Publications. (1998) ISBN 0-486-40066-2. Jack Gibbons (2002). The Myths of Alkan – transcript of a talk given on BBC Radio 3 (retrieved 27.1.2012). Jeremy Nicholas (2007). 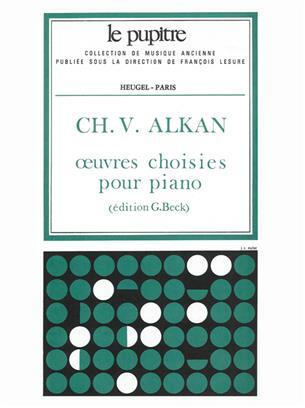 Liner notes, Alkan: Concerto for solo piano; Troisième receuil de chants, Marc-André Hamelin, piano; Hyperion CDA67569. Hugh Macdonald(1978). 'More on Alkan's Death'. The Musical Times 129 . W. H. Rosar, 'Fanelli, Ernest' in Oxford Music Online, Oxford University Press. Ronald Smith (2000). Alkan: The man, the music. Kahn & Averill. ISBN 1-871082-73-0. ^ Ronald Smith, Alkan, the man, the music, London: Kahn & Avril, 2000, p. 18. ^ Alexandre Bertha, "Ch. V. Alkan ainé. Etude psyco-musicale" in Bulletin français de la Société internationale de musique, 1909, pp. 135-147. ^ Ronald Smith, Alkan, the man, the music, London: Kahn & Avril, 2000, p. 73-75. ^ Ronald Smith, Alkan, the man, the music, London: Kahn & Avril, 2000, p. 83.